You know what people say about big feet, right? They're going to need big shoes! Well, with these massive mud mashers you won't need to worry about finding a pair of shoes big enough to squeeze them into. They are built to make it across the roughest terrain. Whether you plan on dressing up as one of the mysterious and often misidentified Sasquatches or a new-age neanderthal these Hairy Feet will be perfect for running away from Bigfoot hunters and hungry dinosaurs. Of course, maybe you're not running from anything. Perhaps you are but a wee hobbit on a grand adventure. Well, if there is one thing that hobbits are good at, it's going out on adventures that end up saving all of Middle-Earth. How can such little critters excel at accomplishing such huge feats? 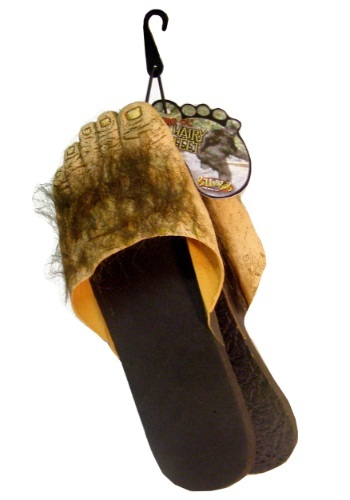 Hmm... We think it might have something to with their huge hairy feets! Slip your own dew-beaters into a pair of these cement-slappers and you'll be ready for any path this Halloween leads you on.